Andreas Gofas is Senior Global Emile Noël Fellow and Fulbright Visiting Scholar at the NYU Jean Monnet Center. 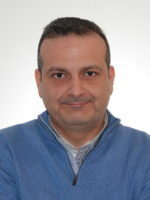 He is Associate Professor of International Relations at Panteion University of Athens, director of the Center for the Analysis of Terrorism and European Security (CATES) at the European Law and Governance School, and co-director of the Olympia Summer Academy. In the past, he has held research positions at the European University Institute (President, High Council of EUI Florence 2014-2015; Jean Monnet Fellow), the University of Sheffield (Marie Curie Fellow), Yale University (Visiting Scholar), the Institut Barcelona d’Estudis Internacionals (Postdoctoral Fellow), and the LSE (Visiting Fellow). His books include: the Oxford Handbook of Terrorism (co-ed, forthcoming), Terrorism and European Security Governance (ed), the SAGE Handbook of the History, Philosophy and Sociology of International Relations (co-ed), The Role of Ideas in Political Analysis (co-ed), and Theoretical Projections in International Politics. The Origins of Transnational Terrorist Waves. Transnational terrorism remains often discussed but theoretically underdeveloped and historically unscrutinized. This is so because the bulk of traditional research on terrorism has been descriptive analysis dominated by a blocking presentism. The project addresses this dual shortcoming in a theoretically and methodologically progressive way. It aspires to provide a full historical comparison of the current wave of transnational terrorism with the anarchist wave of the late 19th century. By restoring historicity to the evolution of transnational terrorism, the project offers a remedy to the prevailing blocking chronocentrism that abstracts terrorism from its broader socio-historical context and contributes to the development of a general theory of the origins of transnational terrorist waves.